Brands and color are inextricably linked because color offers an instantaneous method for conveying meaning and message without words. Have you ever considered the importance of color in branding? Coke is red. UPS is brown. IBM is blue. These corporations understand the proper use of color is vital to creating a positive image among consumers. Furthermore, color plays a huge role in memory recall. It stimulates all the senses, instantly conveying a message like no other communication method. Our minds are programmed to respond to color. For example, we stop our cars for red lights and go on green. Research has reinforced that 60% of the time people will decide if they are attracted or not to a message - based on color alone! Choosing the right dominant color for your brand is crucial. This color should appear on all your promotional materials, including your logo and product packaging. As much as possible, the color you choose should set you apart, work with your industry and image, and tie to your brand promise. It should also take into account color psychology, which is fairly complex. Colors can mean different things depending on the culture, situation and industry. Blue: Blue is perceived as trustworthy, dependable, fiscally responsible and secure. Strongly associated with the sky and sea, blue is serene and universally well-liked. Blue is an especially popular color with financial institutions, as its message of stability inspires trust. Green: Green connotes health, freshness and serenity. However, green's meaning varies with its many shades. Deeper greens are associated with wealth or prestige, while light greens are calming. White: White connotes simplicity, cleanliness and purity. The human eye views white as a brilliant color, so it immediately catches the eye in signage. White is often used with infant and health-related products. 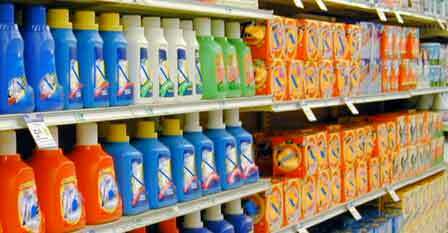 The next time you're in a grocery store, look at the colors of laundry detergents. An overwhelming majority are blue and orange. Blue symbolizes cleanliness and orange is dynamic energy. Therefore, a blue and orange package would clearly communicate "industrial strength cleaning power." People see color before they absorb anything else. Many of the most recognizable brands in the world rely on color as a key factor in their instant recognition.